During my surf of the web this week, I came across something rather interesting: Cigarettea. The design motto: “Don’t smoke tea. Drink Cigarettes,” is fitting for the concept, with an infuser shaped like a cigarette. 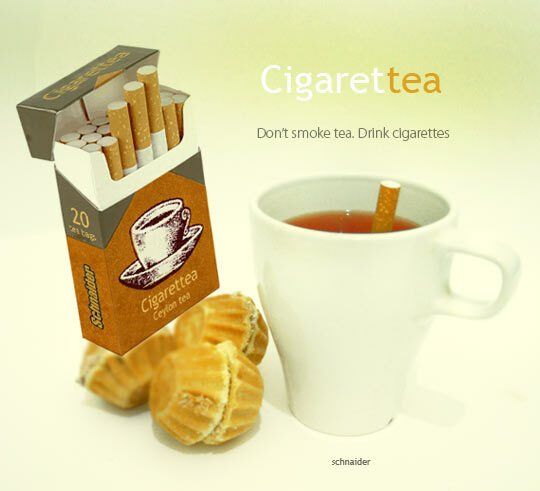 No tobacco is found in this cigarette – only tea. A tea bag shaped like a cigarette? Quite an interesting concept, that’s for sure. The duality between healthy and deadly is construed very effectively in this design. While a cigarette is poisonous, causing cancer, tea helps ward off these diseases. Though I doubt this design would ever hit the market, it would be interesting to see the reactions of individuals shocking others by sticking a cigarette in their mug!